The Abad Nucleus Mall, located in Kochi is a convenient shopping mall which has lot of cheap and best branded things at reliable cost. Shopping will be an enjoyable job here. Scroll down to read more details about the Abad Nucleus Mall. 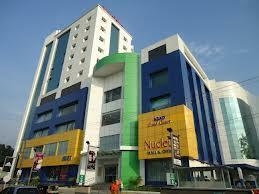 The Abad Nucleus Mall is located in Kochi, Kerala. This mall is constructed in about 13,000 square meters. This mall truly deserves the reward of, LEED certified gold rated green mall. The Abad Nucleus mall was opened on November 10th, 2010 with lots of expectations and the same is being satisfied still. Both Interior and Exterior design of Abad Nucleus Mall in Kochi will attract the visitors at first sight itself. Also, the design includes both Retail space and Office space as well. Yes, the office space holds 4 floors with professional surroundings and the Retail space spreads around 6 floors with attractive stuffs at reliable price. Parking in Abad Nucleus Mall: The Parking lot in Abad Nucleus Mall comes up with a wide area. Yes, the parking area holds up a space to occupy approximately 350 cars and more than 400 two wheelers at a time. Lifts, Elevator and Escalators: There are two modern car lifts available in this Mall in order to make the senior citizen enjoy their shopping in a comfortable manner. This facility is available from Basement to Terrace floor. Also, this mall includes 4 modern and advanced type of Elevators which, is able to carry about 16 persons at a time. The elevator seems to be very spacious with infra red curtains with VVVF drives. In addition to these services, from basement to Third floor there are 6 escalators working continuously for visitors convenience. Dining and Washroom facilities: The facility of Dining and washroom is available for staffs and visitors in all floors. Both these areas are equipped with clean and hygienic products to ensure customer safety. Washrooms are available in this mall for both men and women. Also the central exhaust system is available in every toilet. Air system: This mall has lot of fresh air coming into it, this gives a healthy environment. The Air system used in this mall is 36TR, from heat recovery wheels. The air conditioners are spread all over the mall, those are effectively handled by VFDs from VTS service. Power back up and Water supply: This mall is designed with efficient power back system of 250 KVA. Also, there are 7 DG sets encrypted, which results in 100% power back up. The NBC and BIS standards are used in this mall for ideal water supply and drainage system. The water tanks (OH) of this mall has been designed with a capacity of 50,000 liters. Advanced Technology: Few of the advanced and latest technologies which are implemented in this mall are Fire Detection, intercom connectivity of about 260 ports, 96 high resolution cameras, Fire alarm, Public address system, mobile signal in addition with apex coverage area and many more. In this shopping Zone, the visitors can get branded, healthy products such as fitness system, Jeweles, Eye wears, Watches, Accessories, Bags of all brands, Shoes for both men and women, Apparels etc, all at reliable cost. The blend of taste can be experienced in these food courts at reliable cost. From sea foods to normal dishes, you can get complete delicious food items over here. Since, this shopping mall is positioned in a hottest spot of Kochi, Kerala, the transport facility can be accessed in a simple and easy manner. Yes, it is near to the Kochi metro near to Maradu. The Customer Satisfaction of Abad Nucleus mall stands in an apex level. Yes, the visitors towards this mall is increasing day by day. This is one of the best examples for ideal customer satisfaction. The advanced cameras and comfy environment makes the visitors feel better. The continuous promotions, offers and discounts prevailing in the mall too attracts the visitors.